✉ Address: Floors 1 to 2, Transfer Center of Futian Comprehensive Passenger Transport Hub, Zhuzilin, Futian District, Shenzhen. ☎ Telephone: 0086-755-82787064. Please note, the operator speaks Chinese only.  Opening Hours: 06:00 to 22:00, Monday to Sunday.  Getting there by Metro: Shenzhen Metro Line 1 stops at Zhuzilin Station. Exit D and E of the metro station have the closest distance to Shenzhen Futian Coach Station.  Getting there by Bus: Communter Coach routes 21, 26, 28, 54, 70, 101, 113, 202, 204, 209, 213, 222, 223, 234, b679, 373, 123, 383, 311, 320, 327, 365, 383, 317, 303, n362, h92, 126, E246, m414, m413, 377, m433, m435, m448, Sightseeing Line 1，k359, m372, B611, k384, E6, m447, 46 express, k578 and E10 stop at Zhuzilin Station （竹子林站）. 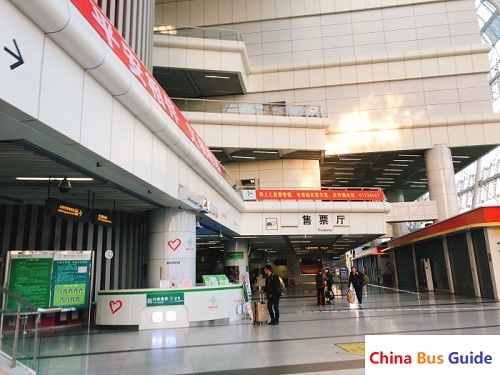 Shenzhen Futian Coach Station has construction area of 30214 square meters. It operates 170 bus routes with 650 bus departures and 4,000 ridership per day.